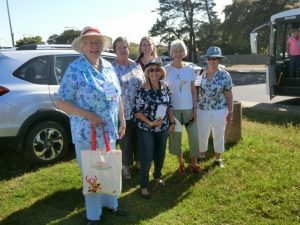 The ROSA National Convention had been in the planning stages for over a year with Joy Webb of the Western Cape Rose Society (WCRS) and her committee committing to the smooth running and preparation of the weekend. At last the 25th October dawned and the Convention was underway. Ruslamere Hotel and Convention Centre was very hospitable and helpful when I checked in and I was allocated a very comfortable and spacey room. Because of the late arrival of the flight from Johannesburg, I went straight into the ROSA special meeting, which was actually just concluding, and then into the ROSA AGM. There were not that many society members present at the AGM. Sadly this is always the case. 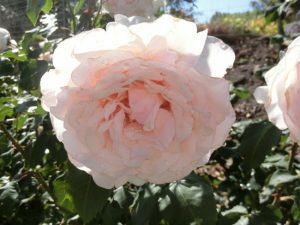 However a sizeable number from Gold Reef Rose Society (GRRS), Heritage Rose Society of SA (HRSSA) and Midlands Rose Society (MRS) were present. Having got the legal stuff dealt with, and receiving a very interesting report from the President, Gail Birss, the nominations for incoming President were shared with the delegates. Barbara Wood (GRRS) was elected as the ROSA President 2018-2020. Council members – Gill Wilson representing MRS, Sheenagh Harris representing Knysna Rose Society (KRS), Jackie Kalley, in her absence, will represent the HRSSA and Vivienne Black, vice president for Africa, attends council meetings but does not qualify to vote. I would like to mention that ALL council members are also members of HRSSA. The HRSSA AGM followed and Sheenagh Harris presented the report for the Society on behalf of Rae Gilbert. Kim Van Niekerk from Bedford shared some recent happenings and events that have taken place. Jackie Kalley was nominated and accepted as the incoming Chairman of HRSSA. At 18h00 a delightful cocktail party took place in the convention room with a cash bar and plentiful snacks. 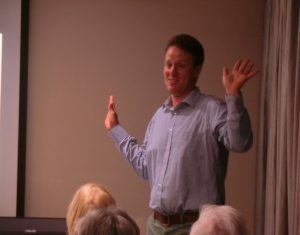 Pietman Diener from Rustenberg Manor Garden addressed us on “Heritage Roses in Old Cape Gardens and the education of a gardener.” A humorous and interesting address. And so the first day was completed. 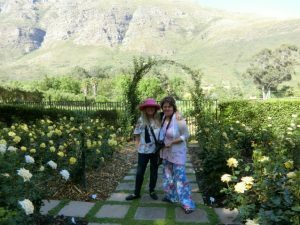 Joy had warned us that we had to leave from Durbanville Rose Gardens promptly at 8h30 on Friday morning. We dutifully turned up and the bus set off for Avondale Garden in Durbanville. The garden belongs to Ronelle Shuttleworth but we were met by her landscaper and gardener, Chris. An interesting tour of the garden to the orchid house, a “kopje” constructed out of the soil removed when the pool was being dug and now planted up with indigenous plants and succulents, a lovely rose garden where “Walter Sisulu” was blooming beautifully and then back to the bus for our next stop. Babylonstoren. Most of us knew Babylonstoren but were more than delighted to visit this amazing place again. On approximately 8 acres it has something new and exciting to present every time you visit. We were treated to a coffee or tea compliments of Babylonstoren. Then it was onto lunch at “Lust” at Vrede and Lust Estate. A light lunch of quiche and salad and for some of us, a refreshing glass of chilled wine. We did not have much time to explore Vrede And Lust but it is nice to have something to look forward to on our next venture into the Cape. The last garden of the day was Muldersvlei Estate. A glass of bubbly greeted us together with the “bubbly” owner, Helen Starke. Chris Bellingen, a WCRS member, was on hand to show us the 200 roses in pots that he has grown. These are used for the decor at the many functions that are held at Muldersvlei. And then an amazing tea/coffee on the lawns with smoked salmon and cucumber sandwiches and freshly baked cream scones. Back to Durbanville to retire home or to our respective lodgings. Saturday morning we were again on the bus at 8h00 and travelling to the Jonkershoek Valley in the Stellenbosch district to visit “Lingen”. 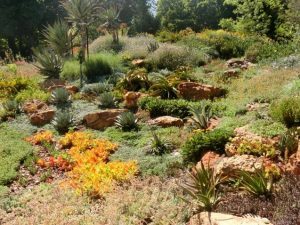 This is home to another WCRS member, Coreen Krige and her husband. 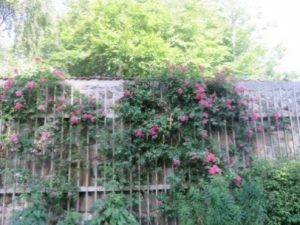 The rose garden was established by Coreen about 15 years ago. The roses are grouped according to colours and the “Roberto Capucci”, “Avril Elizabeth Home”, “Forever Friends” to name but a few were exquisite. Coreen and her husband had prepared a delicious tea/coffee/juice with homemade shortbread of various flavours which was enjoyed by the Convention delegates. Rustenberg Manor House was the next stop. This garden in Stellenbosch dates from the 1700’s. There are over 200 different varieties of heritage roses to which they are constantly adding. The roses growing in some of the trees were delightful. Again tea/coffee or a juice with a cream scone was available for the delegates. 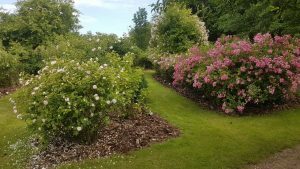 This is a very large garden with different vistas opening up around every corner and one really needs a whole day to explore and see this garden. Our last visit was to Languedoc Farm, Firgrove. 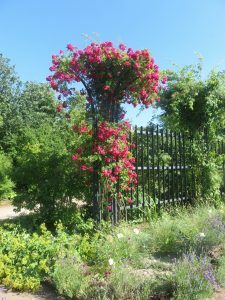 This proved to be a challenge to find but eventually we were met by the owners Nicky and Martin Geberts and introduced to their lovely garden. It was an extremely hot day and the garden was desperately in need of some rain but again a lovely older, private garden. We enjoyed a pizza at Henri’s Restaurant in Somerset West and then back to Durbanville to tidy up for the banquet later that evening. The President’s Award. Decided on by the ROSA President. This went to Sheenagh Harris. The Zoë Gilbert Award. 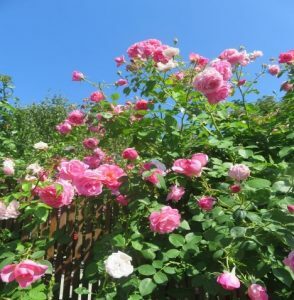 Decided on by nominations from the various rose societies and finalised by ROSA Council. This went to Gail Birss. 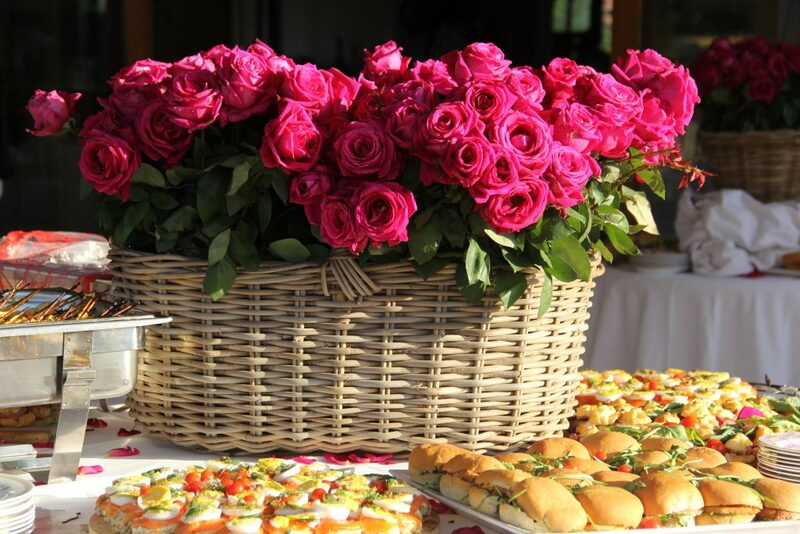 The flowers, the food, the venue and the ambience were a very special way to close the ROSA National Convention – 2018. I would like to express my thanks and I am sure I speak for everyone that attended this convention, to Joy Webb and her committee for all the hard work and preparation they put into this very successful weekend. Joy, the little things that you included in the goodie bags (especially the recipes for different rose products), to the delightful cards, calendars, prints etc that were on sale and also for the lovely bags holding all this paraphernalia made by one of the WCRS members, we salute you. Thank you for hosting us and growing our LOVE OF THE ROSE. After a very hectic and most enjoyable convention in Copenhagen, 9 of the 22 South African delegates, joined the post- convention tour of about 70 people to Sweden. The Heritage Rose Society members were Monika van Heerden and her husband Colin, Claire Meyer and her husband William and Sheenagh Harris. 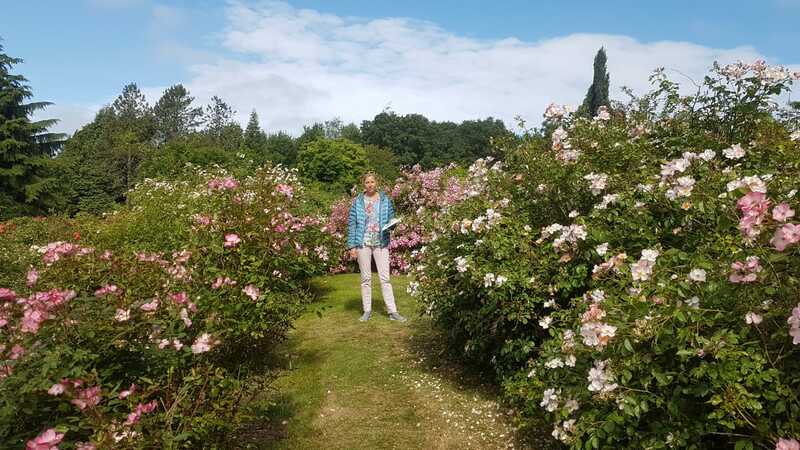 Henny Johansson, President of the Swedish Rose Society gave us a great welcome and travelled with us for the 4 days of this well organised and most pleasurable finale to our time in Scandinavia. From Denmark to Sweden the route took us over the Øresund Bridge which is nearly 8 Km long and includes a tunnel under the water to Skåne and on to the Rose Garden and open-air museum of Fredriksdal in Helsingborg. Lars-Ake Gustavsson, well known in the rose world, was our guide among the collection of 280-300 genotypes of the most valuable old Swedish garden roses, two of which are depicted below…sorry no names! The formal garden with old roses tumbling over arches was particularly beautiful. 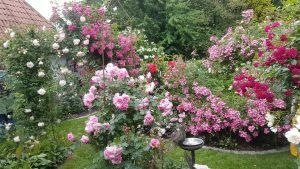 After tea and coffee with delicious eats made by the Rose Society members, we boarded our comfortable bus to Gothenburg Rosarium on the West Coast of Sweden. After a night in a comfortable hotel and a delicious dinner we were ready and eager for the 2 private gardens to be visited on Day Two. The first garden overlooks the sea at Dramsvik, near Ljungskile. Our generous host from the Swedish Rose Society had the tea table groaning with homemade eats including Eggoost which could have been mistaken for pudding. It is a traditional dish served in this part of Sweden. Over another long bridge to the island of Orust for the next private garden at Lunna. It was hot with unusually high temperatures and our host had glasses of cold elderberry cordial to quench our thirst. We were given a picnic lunch that we enjoyed with rose friends in this pretty garden. The pool both inside and outside! The afternoon was spent at the Gothenburg Botanical Gardens which were planned by the local municipality and opened in 1923. I did’t find any roses but enjoyed the many orchids and disas in the glass house, including plants found in South Africa. We had a special dinner lasting 2 hours at the Gothenburg Opera Restaurant that night. Each day in Sweden we traveled through agricultural countryside with atractive farm houses, mostly wooden, painted in pastel colours and as we hopped from island to island there was often a view of the sea. Many fields were brown due to the lack of rain and high temperatures. 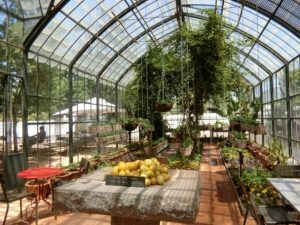 Our first stop on day 3 was an 18th Century estate – Gunnabo House with a formal garden surrounding the mansion and a productive and interesting vegetable garden.